The cell. 8. Cell cycle. M phase. Atlas of plant and animal histology. 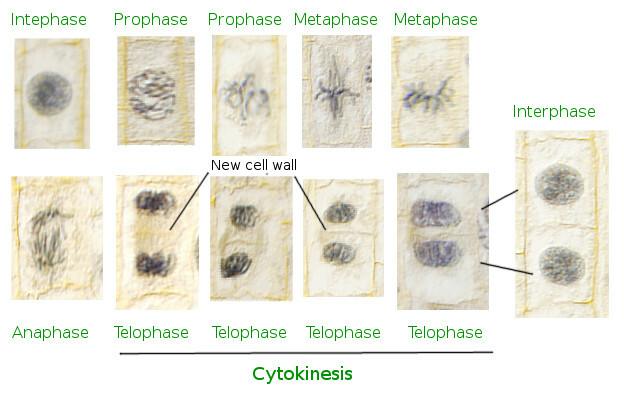 Prophase, metaphase, anaphase, telophase and cytokinesis are stages of mitosis. Prophase: chromatin condensation, some organelles lose their morphology. Prometaphase: disorganization of the nuclear envelope. Metaphase: chromosomes are ordered in the metaphase plate, a place equidistant from the two spindle poles (centrosomes in animal cells). Anaphase: the two chromatids of every chromosome are moved apart from each other toward the poles of the mitotic spindle. Telophase: chromosome movement, chromatin decondensation, and assembling of the nuclear envelope. Cytokinesis: formation of the division furrow, actin ring, and separation of the cytoplasm of the two new cells. Mitosis, or M phase, is the phase where one cell divides into two new cells. During mitosis, the components synthetized during S and G2 phases are evenly divided into the two daughter cells. Mitosis has different stages: prophase, metaphase, anaphase, telophase. Some authors include cytokinesis as part of the telophase. The first three stages are mainly related to the DNA: condensation, movement and uncoiling of chromosomes. The cytoplasm is split in two during cytokinesis by strangulation, which involves fission and fusion of plasma membrane leading to two independent cells. Although most of the processes we are going to deal with are related to chromatin, it must be kept in mind that the rest of the cell components undergo morphological changes, are duplicated, and then are evenly distributed between the two new cells. Prophase starts with DNA condensation so that chromatids can be observed at light microscopy. Nucleolus disappears at the beginning of the prophase. Phosphorylation of histones, proteins of the chromatin, triggers DNA condensation. There are also changes going on in the cytoplasm. For example, cytoskeleton filaments undergo organizational changes, cell adhesion is almost lost so that mitotic cells become rounded. The centrosome is duplicated at the end of the S phase. Initially, the two centrosomes remain together, but they are headed toward opposite sites in the cytoplasm at the beginning of prophase, moved by motor proteins associated to microtubules. After that, both centrosomes start polymerizing microtubules with high dynamic instability (alternance between growing and shortening). Later, these microtubules form the mitotic spindle. Organules like endoplasmic reticulum and Golgi complex are broken in small pieces, and the vesicular traffic is much less intense. The nuclear envelope is still present. Some authors propose a further phase named as prometaphase. The nuclear envelope disorganizes during prometamaphase and is broken in small pieces resembling vesicles. This process is initiated by phosphorylation of the lamina proteins that form the nuclear lamina. In this way, microtubules can access chromatin, which continue the compaction process to become chromosomes. The microtubule plus ends make contact with kinetochores, which are structures located at the chromosome centromeres. Microtubules contacting the kinetochores are known as kinetochore microtubules. Every chromosome has two kinetochores at opposite locations, so that one kinetochore is contacted by microtubules polymerized in one centrosome, and the other kinetochore by microtubules coming from the other centrosome. Thus, every chromosome is linked by microtubules coming from both centrosomes. The number of microtubules converging in one kinetochore is variable, about 20 to 40 in humans, whereas in yeast it is only one. Other microtubules coming from the two centrosomes do not contact chromosomes but interact between each other by their plus ends. These interactions make them more stable by decreasing the dynamic instability at the plus end. These microtubules are known as interpolar microtubules. 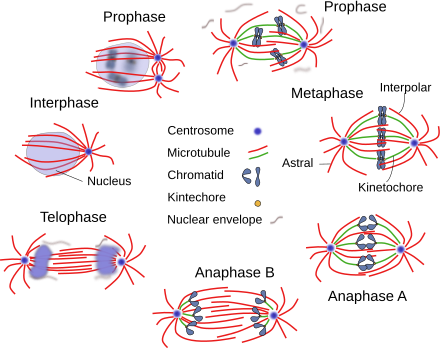 Different stages of mitosis according to chromosome movements. At the end of prophase (or prometaphase), sister chromatids join together to form chromosomes and kinetochore microtubules contact kinetochores. Chromosomes are moved to the center of the mitotic spindle by kinetochore microtubules, at a place equidistant from the two spindle poles (centrosomes in animal cells), forming the so-called metaphase plate. Chromosomes are moved by increase and decrease of the length of kinetocoric microtubules, as well as by the traction force of microtubule associated motor protein. When all the chromosomes are positioned and ordered at the metaphase plate, we have a metaphase figure. When chromosomes are moving toward the metaphase plate, sometimes they can temporarily quit this plate and enter again. This is indicative of the ongoing pull and push forces by the kinetoric microtubules from the two spindle poles, since every chromosome is contacted by microtubules coming from both spindle poles. Mitotic spindle is a scaffold of microtubules, MAPs (microtubule associated proteins), and motor proteins (dynein and kinesin). It is assembled during late prophase and gets its typical form during metaphase. The minus ends of microtubules are concentrated in the spindle poles, whereas the plus ends of kinetochore microtubules contact kinetochores of chromosomes at the mitotic plate. Other microtubules, known as astral microtubules, are oriented toward the cytoplasm periphery close to the spindle pole and their plus ends are close to the plasma membrane. There are another microtubules that do not contact the chromosomes but the plus ends of other microtubules coming from the opposite spindle pole. They are known as interpolar microtubules. Anaphase starts with the split of each chromosome into two sister chromatids. The breakage of the link happens at the centromere and allows sister chromatids to be dragged apart toward the opposite spindle poles. There are two stages: anaphase A, when kinotochore microtubules depolymerize at both minus and plus ends, so they shorten and chromatids are dragged; anaphase B, when interpolar microtubules polymerize and increase in length so that they push the spindle poles in opposite directions, and therefore the kinetochore microtubules and chromatids are also separated. Motor proteins associated to the plus ends of the interpolar microtubules provide the dragging force to move away the spindle poles by sliding one interpolar microtubule coming from one spindle pole over another microtubule coming from the other spindle pole. The shortening of astral microtubules has been proposed to increase the distance between both spindle poles by dragging spindle poles toward the superficial part of the cell cytoplasm. During telophase, nuclear envelope is assembled around the two groups of chromatids which have been dragged toward the two spindle poles. Then, two nuclei are formed. Phosphorylation of lamins, proteins of the nuclear lamina, initiates this process. 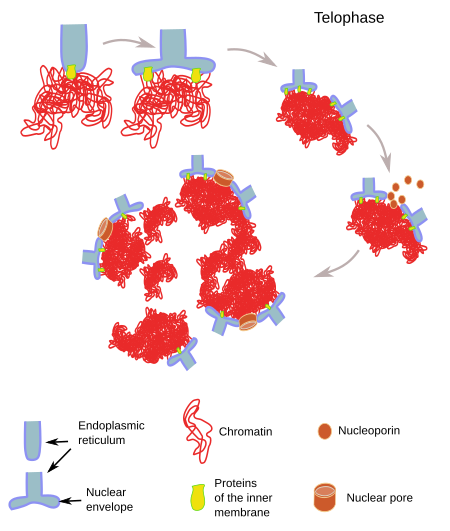 Nuclear pores are also assembled and uncoiling of chromatids begins. Previously, microtubules were released from kinetochores. Assembling of the nuclear envelope and nucleus formation during telophase. The nuclear envelope is assembled from endoplasmic reticulum membranes. Proteins located at the inner membrane of the nuclear envelope link the chromatin to the nuclear envelope (modified from Wanke y Kutay, 2013). Cytokinesis is the last stage of the cell cycle. During cytokinesis, the cytoplasm is divided and gives two new independent cells. This division takes place after the chromatids have been pulled apart, otherwise ploidies (unequal distribution of chromatids between the two daughter cells) may happen. Cytokynesis is different in animal, plant and fungi cells. However, they all follow some similar steps: choose the orientation of the division plane, assembling of the division molecular machinery, and the division of cytoplasm. In animal cells, the division plane is set by the orientation of the mitotic spindle, and the first evidence of the start of cytokinesis is a furrow, known as division furrow, on the cell membrane. The division furrow is perpendicular to the mitotic spindle and is located in an equatorial position (at the same distance from the two centrosomes). The interactions between actin filaments and myosin motor proteins causes the division furrow. Actin and myosin form a contractile ring, which is assembled during the final part of anaphase. Actin filaments slide over each other pulled by myosin molecules, decreasing the diameter of the ring and strangling the cytoplasm till the ring gets completely closed. However, before that, the spindle microtubules trapped by the ring must be removed. Furthermore, a complex process is the opening and sealing of cell membranes to give two independent cells. The actin-myosin ring is transient and disappears after cytokinesis. In both animal and plant cells, it has been observed that the organelles involved in the vesicular traffic are needed during the final part of cytokinesis, by providing more membrane for the new plasma membranes, but also the protein machinery to deal with breakage and fusion of the membranes, processes that are similar to those of the vesicular trafficking. Cytokinesis in sea urchin zygote. The more brilliant area is the mitotic spindle. The cleavage furrow and the division plane are perpendicular to the mitotic spindle axis. In plant and fungi cells, cytokinesis is different because of the cell wall. The two new cells do not get separated by a ring of actin filaments. Instead, a new cell wall is formed in the interior of the progenitor cell that divides the cytoplasm in two parts. In plants, the first evidence of this new cell wall formation is the phragmoplast. Phragmoplast is a complex structure composed of some microtubules from the mitotic spindle and vesicles arriving from the two Golgi complexes (one per new cell). Vesicles coming the Golgi complexes are moved to this central area by microtubules and motor associated proteins. Vesicles fuse between each other and start to form the cell membranes of the new cells, whereas their content gets together to form the medial lamina of the new cell wall. In plants, the cell wall grows centrifugally, i.e. the new layers are assembled internally so that the more external layer is the first to be synthesized (medial lamina). In fungi cells, which have no phragmoplat, it is in the other way around, the more external layers are the more recently synthesized. A division furrow is not observed in plant cells, but it is present in fungi cells. In plants, the orientation and position of the division plane is established under the influence of the nucleus during the late G2 phase. Microtubule bundles are oriented around the cell nucleus before the M phase starts, and this scaffold, known as preprophase band (PPB), leaves a trace in the cortical cytoplasm. The bundle of microtubules around the nucleus disappears at the beginning of the mitosis, but the alterations they made in the cortical cytoplasm affect the formation of the pragmoplast. Stages of mitosis, from prophase (left) to telophase (right) in onion root meristem. The formation of a new cell wall happens at an equidistant place from the two sets of chromatids, which form the two nuclei of daughter cells. This initial structure that evolves into the new cell wall is the phragmoplast (arrow). The process is also observed in this image.